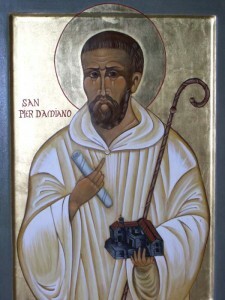 ST. PETER DAMIAN was born in 988, and lost both parents at an early age. His eldest brother, in whose hands he was left, treated him so cruelly that a younger brother, a priest, moved by his piteous state, sent him to the University of Parma, where he acquired great distinction. His studies were sanctified by vigils, fasts, and prayers, till at last, thinking that all this was only serving God by halves, he resolved to leave the world. He joined the monks at Font-Avellano, then in the greatest repute, and by his wisdom and sanctity rose to be Superior. He was employed on the most delicate and difficult missions, amongst others the reform of ecclesiastical communities, which was effected by his zeal. Seven Popes in succession made him their constant adviser, and he was at last created Cardinal Bishop of Ostia. He withstood Henry IV of Germany, and labored in defense of Alexander II. against the Antipope, whom he forced to yield and seek for pardon. He was charged, as Papal Legate, with the repression of simony; again, was commissioned to settle discords amongst various bishops, and finally, in 1072, to adjust the affairs of the Church at Ravenna. He was laid low by a fever on his homeward journey, and died at Faenza, in a monastery of his order, on the eighth day of his sickness, whilst the monks chanted matins around him. Reflection.—The Saints studied, not in order to be accounted learned, but to become perfect. This only is wisdom and true greatness, to account ourselves as ignorant, and to adhere in all things to the teachings and instincts of the Church.